January 28, 2014—Encouraging older drivers to self-regulate their driving rather than revoking their licence based on age, has the potential to improve their safety and maintain their independence, aQUT study has found. Dr. Ides Wong, from QUT's Centre for Accident Research & Road Safety—Queensland (CARRS-Q), said a person's age was not an accurate predictor of their driving ability. "People do not wake up on their 75th birthday a worse driver than they were the day before, which is what current age-based testing assumes," Dr Wong said. "We know that as people age their physical, cognitive and sensory abilities decline. However, aged-based testing for older drivers, although popular within legislative and public domains, is problematic because we lack consensus as to which age-based tests can accurately predict a driver's performance." As part of her recently completed PhD, Wong looked at whether self-regulation of driving behaviour was adopted by older adults. "Older drivers tell us that they have changed their driving patterns as a result of age, for example restricting their night-time and long distance driving habits to reduce the challenges of high-pressure driving," she said. "As part of my study I used in-car monitoring to confirm that older drivers do self-regulate their driving such as avoiding peak hour traffic and night-time driving. "This suggests that rather than discriminating against older drivers because of their age by restricting their way of getting around town, we could aim to improve their safety, as well as mobility, by supporting them to self-regulate their driving behaviours." Wong said as the world's adult population was rapidly aging, managing the safety of older drivers was fast becoming a critical social and public health issue. "We do know that taking away a person's licence impacts on their mobility, independence, health and overall quality of life. "Not having a licence can be socially isolating and result in health issues like depression." Wong said while older drivers had a higher crash risk when measured per kilometre, the fact they tend to drive significantly less than other age groups exaggerated this statistic, giving them an unwarranted bad reputation on the roads. "They have a far lower crash risk when compared to younger drivers, but when they do crash they are more likely to be seriously injured or killed, because they tend to be more fragile." Wong said her study found older drivers who had support from a "driving partner" to share the driving load, self-regulated and reduced their time behind the wheel. She said access to public transport also reduced older drivers' time on the road. "There are a lot of positive implications for supporting self-regulation of driving behaviour compared with using age to determine a person's driving ability," Wong said. 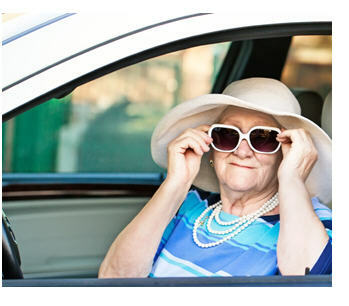 "Older drivers can reduce their reliance on their licence, while staying mobile and independent. "Then when they must stop driving because of a decline in their ability, it will have less of an impact on their quality of life because they already have other means to meet their transportation needs." Press materials provided by Queensland University of Technology (QUT).